Vidal Tecidos, was founded in 1966 by José Manuel Vidal. In the beginning the core business was was to supply articles to the cleanning and automobile industry. During the 70’s, the company spread its activity to the distribution of materials and accessories to the upholstery and furniture industry. 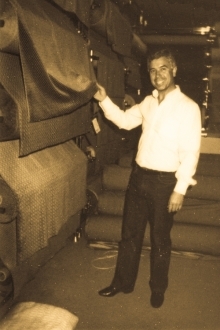 Only in the 70’s, start to trade the first fabrics, at the time velvets manufactured in Portugal, what therefore made second-guess a turning point in the direction of Vidal Tecidos. The decade of the 80’s scored a change in the company, specializing in decorative fabrics. Plain and printed chintz, velvet, gobelin, jacquard fabrics, silks, linens and cottons, began to represent a very important slice of the business. The 90’s consolidate a name that occupies a prominent place in the world of decorative fabrics. With five decades of existence, Vidal Tecidos is recognized in the world of decoration as a benchmark when it comes to quality fabrics. With clients all over the world, the company has been able to follow fashion trends, preparing season to season the collections according to the trends imposed by the major world designers. In the beginning of the new millenium, was created the Vidal Prestige collection, a careful selection with the best and most exclusive creations of the main international designers. It represents a condensing of luxury, quality and prestige, always present in their products. In the last years the company standed out in the global market by releasing two webshops, one in portuguese for the national market and the portuguese speaking countries, and another one in english, for the global market.